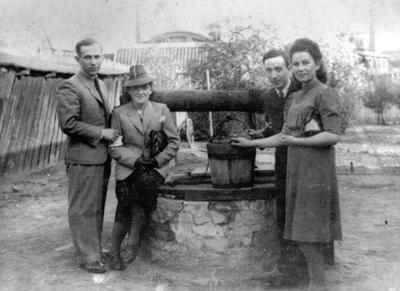 Holocaust Survivors: Photo Gallery - "Couples at a Well"
Before the war young couples went out walking together on the weekends. Photographers made a living taking pictures of people on the street. In Czestochowa, the more modern houses had running water, but many people still depended on wells. Left to right: Isaac Blitz, Rachel Israelovicz Sher, Joseph Sher, Sara Blitz. Sara Blitz, no relation to Isaac, was sent to Treblinka. Isak, Rachel and Joseph survived.